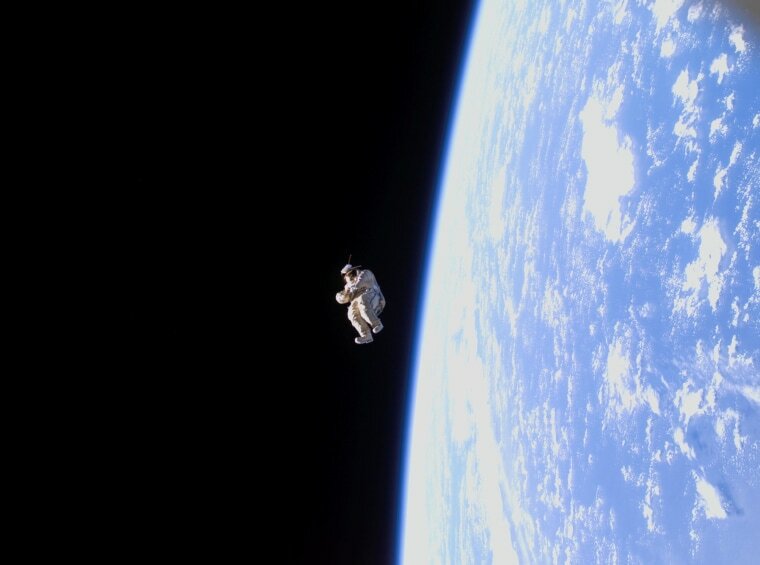 This photo of a lone spacesuit floating away with no tether might send a chill up anyone's spine — but don't worry: It's not a spacewalk gone wrong, or even a promo picture for "Gravity 2." It's the result of a 2006 experiment to make a spare suit into a working satellite. NASA's popular Astronomy Picture of the Day website posted the picture earlier this week, but without the proper context, you might think something horrible happened. The reality was far from horrible — though the first attempt at a "SuitSat" wasn't exactly a great success, either. Russian cosmonauts aboard the International Space Station decided it was time to retire one of their older Orlan spacesuits. But instead of trying to keep the working pieces and discard the rest, they performed a unique experiment. They attached a battery-powered radio transmitter to the suit, stuffed it with trash and old clothes, and sealed it tight. With luck, a careful push out the space station's "back door" would send the suit into a lower and slower orbit, letting observers on Earth track its progress before its inevitable disintegration in the atmosphere. The bad news is that the radio signal was weaker than expected. No one's sure why; perhaps the transmitter was fried by radiation. The good news is that cosmonauts put SuitSat on an orbital trajectory that was more stable than expected: It re-entered Earth's atmosphere and burned up in September 2006, a good seven months after its "Gravity" moment.